With growing snow cover and spring on the horizon, people are wondering about what the outlook is for Lake Manitoba this summer. The first flood outlook was published by the province this week and is not particularly good news for Lake Manitobans. We can expect significant flows on the Portage Diversion (more than needed to clear ice on the lower Assiniboine). With flooding expected on the Red River, we should expect the Portage Diversion to be used by the province to reduce Assiniboine River flows to Winnipeg, which means more water will be diverted than needed to protect against just Assiniboine River flooding. The good news is that there is some freeboard on Lake Manitoba, with the lake currently sitting 12” below the top end of the operating range. Lake Manitoba will rise during the spring freshet: it is just a question of how much, and that will be largely dependent on weather conditions from this point forward. 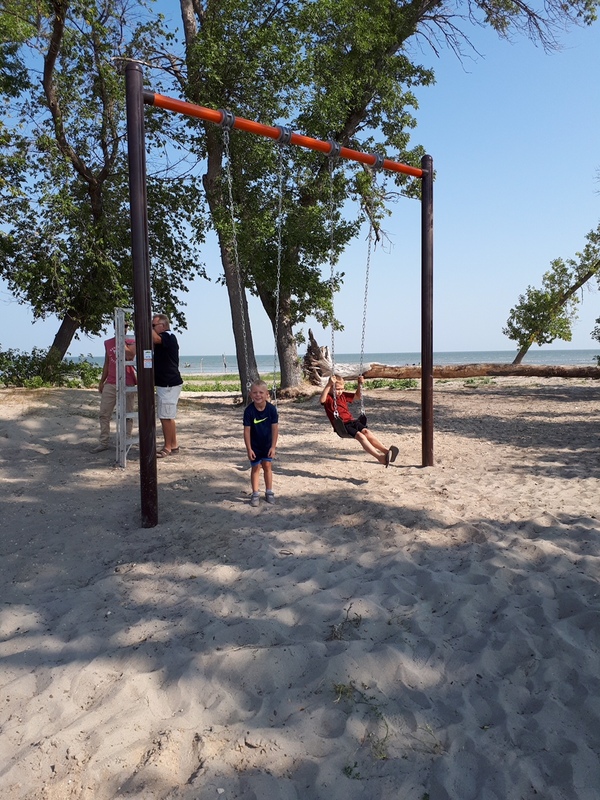 The province is forecasting that Lake Manitoba will remain within its operating range (below 812.5 feet) even under adverse (upper decile) weather conditions. The Fairford Water Control Structure is currently operating at 85% of capacity. It will be opened to 100% capacity when Lake Manitoba reaches 812.5 feet. It is hoped the work will be completed by the summer. It is with great sadness that we share the news that Sheila Henderson has passed away. Sheila was a fixture in our Delta community and together with her husband Rick, has made many contributions to Delta. She will be deeply missed. A service to celebrate Sheila’s life will take place at the Trinity United Church on Saturday, December 15, 2018 at 1:00 pm led by the Reverend Julie Baker. This year a swing set and climbing apparatus were set up by a group hired to do the job professionally. Colleen Tomalin was in charge of everything from researching to ordering to overseeing the project by herself. She has done an amazing job on behalf of the DBA and rightfully deserves the recognition for its success! She even got Rick Henderson to come down and till the “road” between the two parking lots. 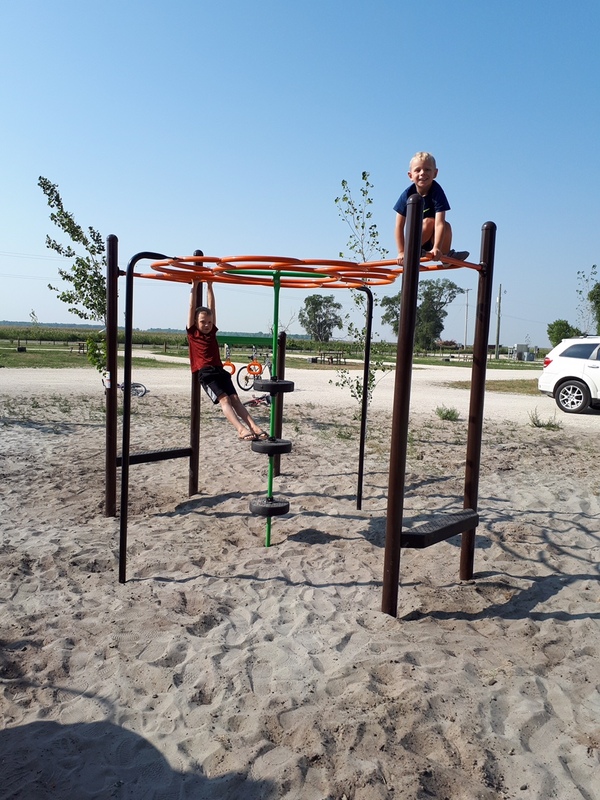 The men hired to set up the equipment were overseen by Colleen and she got them to place logs at each end to block off further access to this area as it is a place for kids to play. Next year she plans to continue to add to the equipment with more swings and apparatus. An amazing job, Colleen. Thanks for your energy end effort to make this a great place for all Delta kids to play. How is this for a hot-day story? It is about my dear old mother, Gracey, who loved to tell us kids of how she was a little girl living “by the sea”. Yes, it was in Hastings, right on the English Channel.